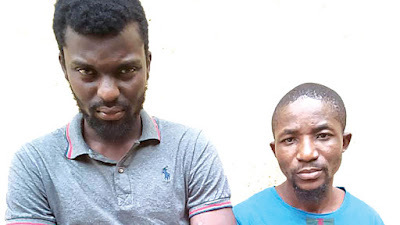 Two self-confessed members of a notorious cult group, Olakunle Ogunyemi aka Pedro, and Anthony Bello aka T-boy (both pictured above), have been arrested in connection with the murder of an Austrian returnee, in Iba Housing Estate, Lagos State. According to a report by The Guardian, the notorious criminals were arrested two years after the act. The deceased, Micheal Chinenu, who visited Nigeria to have his traditional marriage, was allegedly stabbed to death during a fight with the suspects at a football pitch in Iba. Trouble started after both parties visited the football pitch to watch a friendly match between two communities. In the process, the deceased and Ogunyemi were embroiled in a verbal confrontation, which degenerated into a fight. When it became clear that the deceased was overpowering the latter, Bello allegedly used a knife to stab the Austrian returnee in the chest, in his bid to assist his colleague. The duo immediately fled the scene, abandoning their opponent to his fate. Chinenu died a week later, after a futile effort by doctors to revive him at an undisclosed hospital, due to loss of blood. The suspects were however arrested by operatives of the Federal Anti Robbery Squad (FSARS), Lagos State Police Command, in their hideout, two years later. Bello, a.k.a. T-boy, admitted to have stabbed the deceased in self- defense. According to him, “I went to play ball at the football pitch when I heard an uproar. On reaching the scene, I saw a man engaged in a scuffle with Pedro (Ogunyemi ). In my attempt to intervene, the man slapped me. He left Pedro and faced me. He hit me on the ground twice and used a tyre rim to hit me. The 31-year-old Ogunyemi, holder of an Ordinary National Diploma (OND) from the Lagos State Polytechnic, disclosed that he joined cultism at the age of 17. Ogunyemi, who is an only son of his widowed mother, explained that on that fateful day, he was discussing with a friend he identified as Lexi, when the deceased came and rudely interrupted. They would be charged to court for armed robbery, cultism and murder.